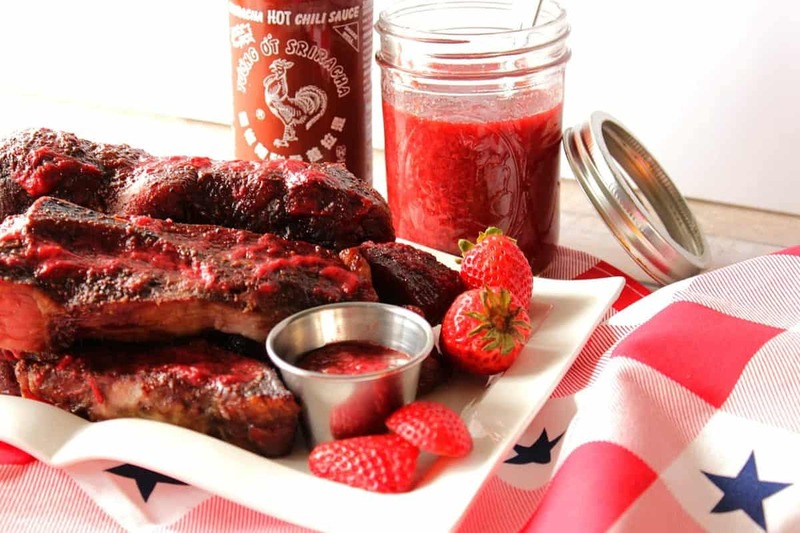 Strawberry Sriracha BBQ Sauce is fruity with a touch of heat. It’s perfect for pork, chicken, and even fish. Welcome to day two of “Berry Week” here at Kudos Kitchen. 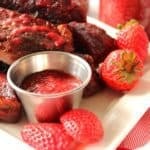 The recipe for Strawberry Sriracha BBQ Sauce that I’m sharing with you today is one that was born out of necessity. The problem of having too many strawberries in the fridge and not knowing when they’d all get eaten without spoiling led me to this tasty brainstorm. This is an updated post. The original date I shared this recipe was July of 2016. Since then (May of 2017) I’ve produced a new food video showing the process of making this Strawberry Sriracha BBQ Sauce. To be honest, this recipe has been on my mind ever since I first made this sauce because it is amazing! This time when I made it I added it to chicken and. let me tell you, it lives up to everything I said about it in the first place…only more! The day I made this sauce my mom was over for a visit. When I told her I was planning on making Strawberry BBQ sauce, I think she thought I was crazy. I thought I might be crazy too, but sometimes you just have to follow your gut and take a leap of faith. That day in the kitchen with my mom, the sauce came out good, but I knew it could be improved upon. A few short days later I purchased more strawberries and decided to play a little with the ingredients. Instead of using balsamic vinegar, I used apple cider vinegar. Instead of using honey, I used brown sugar. And, to punch up the flavor just a wee bit more, I squirted in a little sriracha to finish it off. Bingo! That’s exactly what the sauce needed to take it from good to great, and just in time for grilling season! …until the strawberries are softened (about 15 minutes). Stir in the brown sugar and apple cider vinegar. Simmer for an additional 15 minutes for the sauce to thicken and reduce. Remove from heat and mash the berries lightly to still leave a bit of consistency. Stir in the sriracha and cool slightly before adding it to a glass jar or bowl. Cover and refrigerate for up to 10 days. Place the cut strawberries into a medium saucepan. Add water, vinegar, brown sugar and salt. Simmer over medium heat for 20-25 minutes, stirring occasionally. Add the sriracha sauce to the cooked down strawberries and mash to your desired consistency. Cool the sauce and place in a jar with a tight fitting lid. 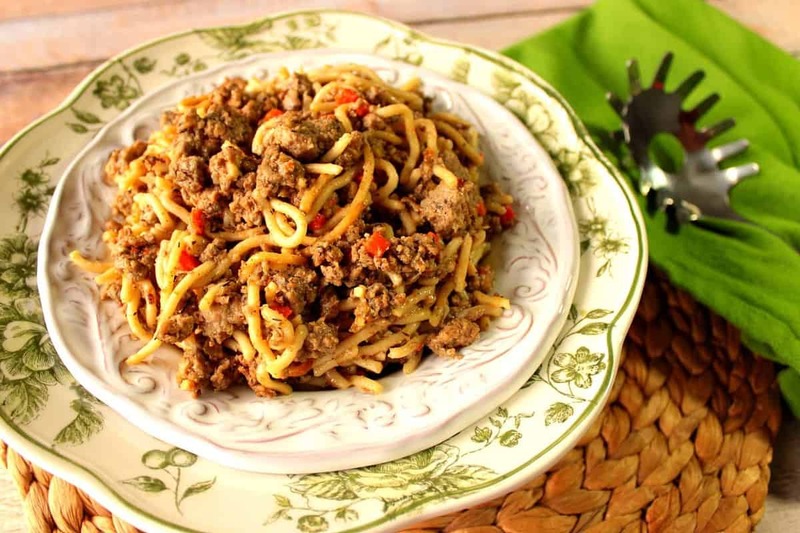 Use the sauce on beef, pork and even seafood. Keep refrigerated for up to 10 days. 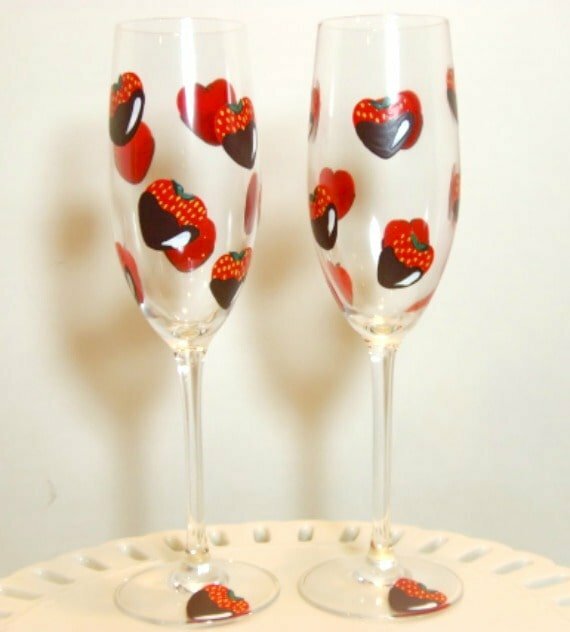 Cheers to a great Strawberry Sriracha BBQ sauce, and also to some really cute hand painted chocolate strawberry inspired champagne flutes. Think about using them for all sorts of celebrations (wedding season) when you want to toast your sweetheart with something special. All of my hand painted glassware items are completely dishwasher and microwave safe, and non-toxic. However, with a glass a delicate as a champagne flute, please hand wash only. I love custom, special requests and always welcome them. If there is ever anything I can paint for you, please don’t hesitate to contact me for a quote, or visit one of my shop : Wazala. I also paint fabrics (aprons and tea towels) which are totally machine washable and painted with bright, vivid colors. What can I paint for you? Thank you Renee. I have the same problem and will make this recipe. Thank you. I love the BBQ Sauce you made! Sweet and Spicy is the best combination! 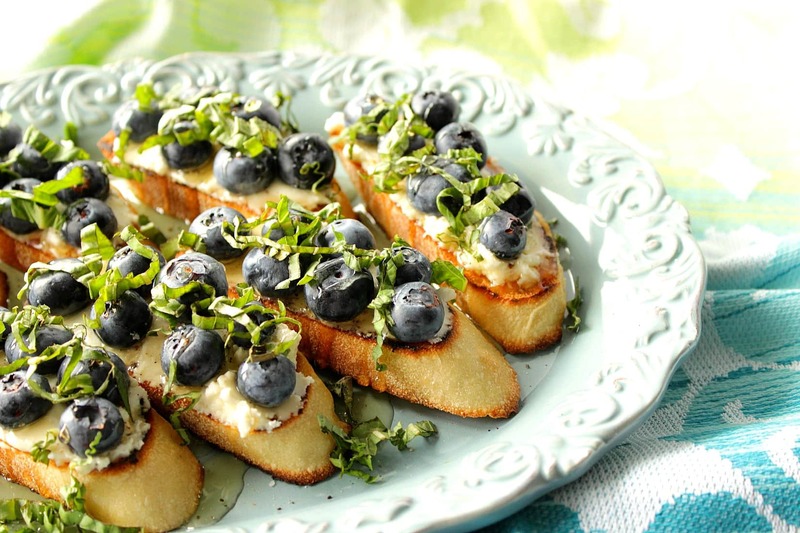 I love this idea…sweet with the savory is the best! I’m going to try it with grilled chicken this week! I hope you do, Ashley. I know you’ll love it! First of all, these pictures are gorgeous! I absolutely LOVE the flavors in this! Thank you so much. Lauren. That means a lot to me! Yum! 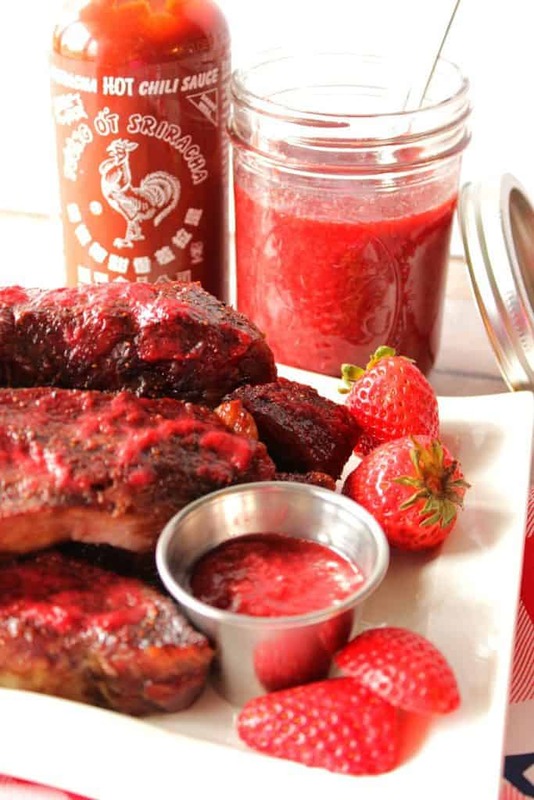 I’ve never thought to pair sriracha with strawberries, I absolutely need to try this! I hope you do try it, Laura. You’ll be happy you did! Pretty sure my family would think I am crazy if I told them I was putting strawberries in BBQ sauce, but it sounds delicious and I know they would love it! I thought I had lost my mind, too, but I figured it was worth a try. So glad I did. It’s delicious! What a brilliant idea for barbecue sauce! 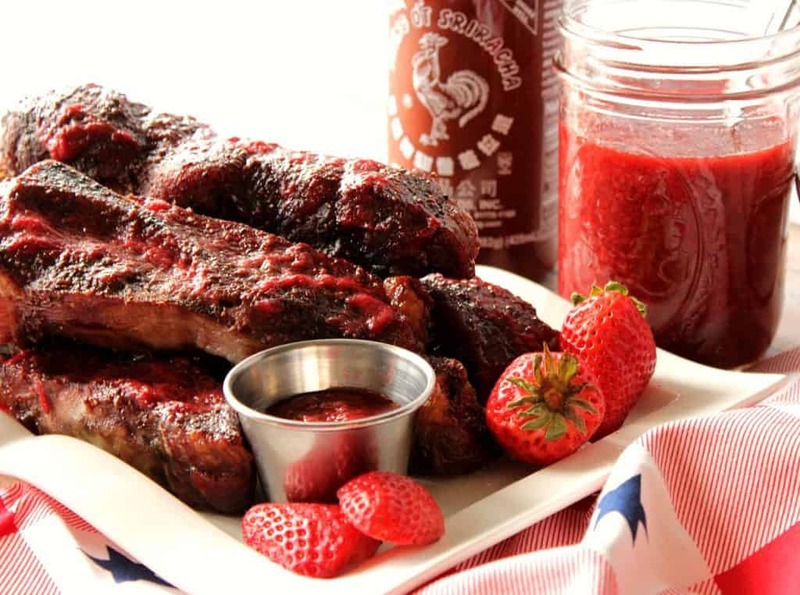 We love barbecue in the summertime, and I’ve never seen a sauce that calls for fresh strawberries… and I absolutely cannot wait to make this! I can’t get enough of strawberries these days, and it seems you are in the same predicament as me! How interesting to pair with sriracha and make a BBQ sauce. I bet it is great and I’ve got to try it, since I’m such a berry fan!!! Yes, do try it, Lora. I think you’ll be pleased. 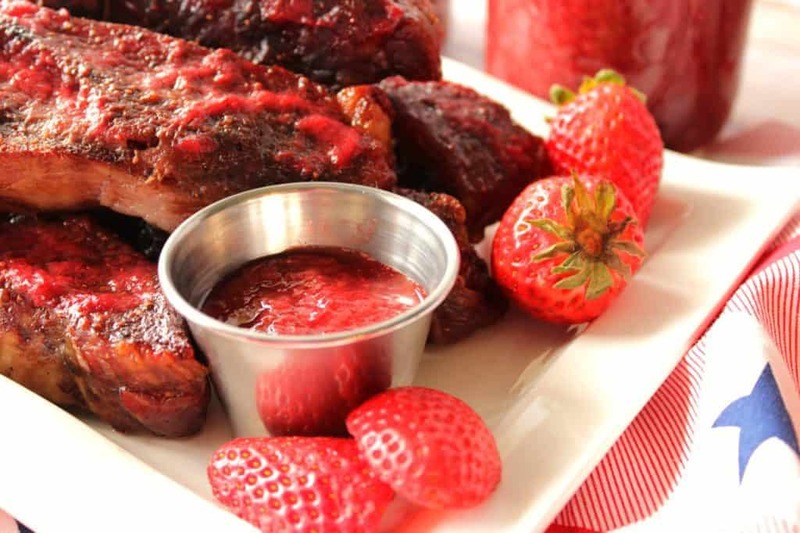 We love BBQ sauce with strawberries, it’s so flavourful. I love that you used sriracha in this. I can just imagine the taste, sweet heat, my favourite. I also love watermelon for smoking ribs. So good. How did you know that sweet & spicy BBQ sauces are my fave?? 😉 This sounds and looks delicious! What a fun combination of flavors!! Love Sriracha, I’ve mixed it with grape jelly before, which was actually a really good spicy, sweet combo. But this recipe sounds so much better!! Oooh, I love the idea of the sriracha mixed with grape jelly. Sounds yummy! What a flavor combo! 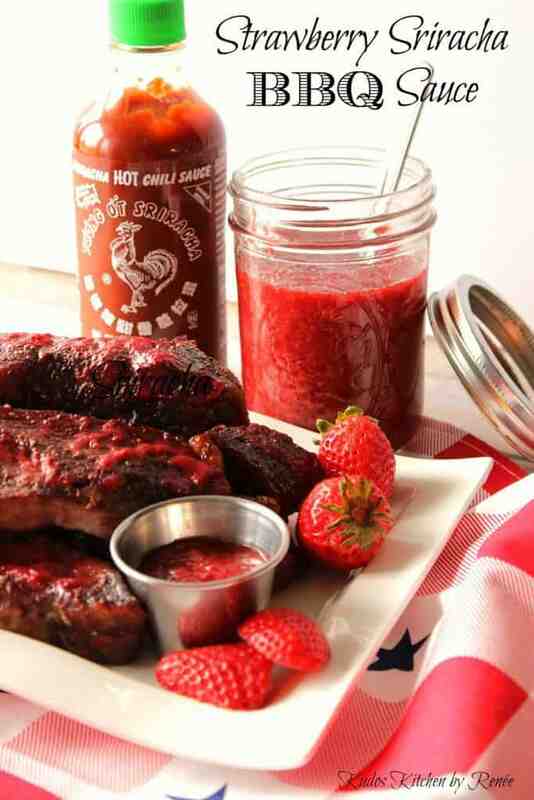 I don’t think I’d ever think to make a strawberry BBQ sauce. I wonder if I can sneak this by my husband who hates strawberries??? I love the stemware! Those chocolate covered strawberries are so cute!! Thank you so much, Karyn. I’m glad you like the glassware.